During your first session I will clarify and understand what you are currently experiencing and what you want to achieve from therapy. I will take a full assessment of your past and current situation, your health and lifestyle, and the changes that you want to make. You’ll have every opportunity to ask any questions, and we’ll create a treatment plan and agree a number of sessions to achieve your desired outcome. The number of sessions you will need varies and this is dependent on your needs, situation and the therapy used. I work short and long term, and can give you an estimated number of sessions, but I usually recommend 6 sessions will allow you to see how well the therapy is working for you and experience some change. Thereafter you can decide how much work you want to do. I offer full 60 minute sessions rather than the traditional ‘therapy hour’ of fifty minutes. Everyone processes at different rates, and after a few sessions you will find that you’ll settle to your preferred session length – usually between 1 and 1 ½ hours. For fast results, the uniqueness of my therapy sessions are that I can develop a bespoke plan of therapy for you. You may require flexible weekly, fourtnightly or instense course of treatments than that of weekly sessions. Half day and full day sessions can be made available in your plan. The bespoke therapy sessions are individually tailored and may include traditional medical advise, complementary therapies such as nutrition, massage, accupunture, financial and fitness advice. If you want to work on a specific problem, breakthrough sessions are available. These vary from 3 - 5 hours in length and can be held in-house or at my practice locations. This includes lunch, tea and coffee breaks for individual or group sessions. Emergency and one-off sessions are also available, these are charged at a higher rate. 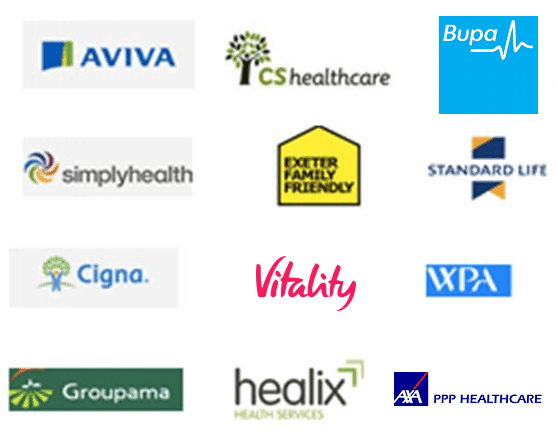 I am a recognised registered health provider for the following insurance companies. Your therapy session fees may be covered by your health insurer. You will need to find out from your insurers if there are any limitations or excess that you may need to pay. All excess or any amount that is not covered by your insurers you will be liable to pay this directly to your therapists. If your health insurer is not listed, please contact me and I can register with your insurer to allow therapy costs to be covered for you. If your insurance company requires a psychiatric referral, or if you wish to discuss the option of medication, I can refer you to an experienced psychiatric colleagues I work with closely. You will be required to indicate whether you do or do not consent to any communications with your GP or other medical professionals. For my insurance purposes you GP information is required. I will not make any contact with your GP without your full written consent. If you are taking any prescribed medication or having medical treatments, your GP may be required to be informed of your therapy. Therapy is not to replace your medical treatments or to stop you from seeking medical advice from your general practitioner or consultant. I offer therapy to individuals, couples and children. You can self-refer or be referred by a medical professional, employer, friend or family member. Full and informed consent is required by all adults having therapy with me and direct contact with the client must be made to arrange the appointments if over the age of 18. Your confidentiality is strictly upheld. Your consent will be sought where the law requires it to be broken, or in the event of self-harm, harm to another or to a child is involved. All sessions are held in a safe and non-judgemental environment. How soon will you see me? In most instances you’ll be seen within a week of your initial contact. In an emergency, you can be seen within 48 hours depending on availability. On some occasions, I may operate a waiting list due to high demand. If this is longer than 2 weeks I will let you know. Therapy is normally face-to-face. In the event of travel or distance may be a challenge or that you are overseas I offer Skype, FaceTime, email and phone sessions. Taking on the services from the initial session, a 48 hour weekday notice is required for cancellation or to reschedule your appointment for whatever reason it may be. Otherwise the full fee is charged for non-attendance. Unless previously agreed or your fees are paid for by your employer or health insurer, payment is to be made at the end of each session. For Skype, Facetime and phone consultations, payment must be received in advance. You can pay by cash, cheque, PAYPAL, or bank transfer/BACS. If you pay by credit card there may be an additional charge of 3% made by the card provider. As an accredited therapist, I abide by the Ethical Codes of Good Practice of the British Association for Counselling & Psychotherapy (BACP). And the Association of Neuro-Linguistic Programming International (ANLP) guidelines as a professional practising practitioner. Fees are dependent on the type of therapy, length of sessions, time of day and location. Fees payable via cash, cheques, bank transfers and secure payments can be made with all major credit cards, visa debit and paypal. Payments can be invoiced to your insurance company, employer or designated payee. The focus is on the person’s past. Deals with healing emotional pain or conflict within an individual or in a relationship between two people.Some forms of therapy e.g., Brief Solution Focused and CBT focus on the future. Focuses on a person’s present, in order to help them create actionable strategies for achieving specific goals in one’s personal and work life and act towards the future. The emphasis in a coaching relationship is on action, accountability. A highly experienced coach will know when to look at the past because it informs the present, as well as in order to help distinguish limiting belief systems. Based on feelings and emotions. Medical or clinical diagnosis of pathology or relationship conflicts. Learning and developmental, focusing on attainable goals and possibilities. Understand and resolve the past. Understanding the past in the context in which future goals are set. The goals of therapy are for the person to be accountable for their feelings and emotions and change can be identified internally but not usually measurable unless using a CBT. Coaching goals, like business goals, usually have to do with one’s external world and behaviour and is measurable. The therapist offers perspectives and helps the clients discover their own answers. The coach offers perspectives and helps the clients discover their own answers. The Coach stands with the clients and helps him or her identify the challenges, then partners to turn challenges into victories, holding client accountable to reach desired goals. Therapists require extensive expertise in the subject matter of the therapy: marital counselling, childhood abuse, etc. A therapist can use coaching skills to support the client. Coaches, deal in process, do not require subject matter expertise. Coach with work, training and education background enhances and utilises their experience towards greater understanding and knowledge of the clients issues. Coach can utilise counselling and diagnoses to enhance the client towards unlocking past limitations to achieving goals for e.g., bullying at school affecting being experienced at work. Patient, nurturing, evocative, indirect, parenting, cathartic. Progress is often slow and painful because the issues are often subconscious and fundamental. The therapist is responsible for both the process and the outcome. The coach is responsible for the process; the client for the results. Personal disclosure by the coach used when relevant as an aid to communicating. Often covered by health insurance; or through an Employee Assistant programme. Otherwise self funding or a relative. Not covered by health insurance. Employers may pay for coaching of individuals or groups.